What if I told you there was a globally-minded, socially conscious, affordable luxury brand that sold beautiful and functional accessories? It seems too good to be true, right? Well that is exactly what Lions in Four are doing. They sell fashionable clutches and scarves that give back in more ways than one. First of all, they partner with WE CARE of India, which is a organization empowering women and educating children of rural villages in (you guessed it!) India. Right now Lions in Four are also working to create their own artisan studio and training facility, which will allow them to provide sustainable employment for women and girls in rural South India. On top of all that goodness, Lions in Four use eco friendly materials such as high quality recycled leather and Italian eco-suede, which is actually used on some Porsche and Maserati seats. So cool! Also, all of the silk they use is hand woven and hand dyed in all natural vegetable dyes. No chemicals here! I had the opportunity to ask Julie Martin, the founder of Lions in Four, some questions about her company, inspiration, and her experiences with nonprofits and social entrepreneurship. First off, how did you come up with the company name Lions in Four? Lions in Four was named as an inspiration from India’s national monument…it has four lions looking North, South, East, and West….Looking out for each other. Each lion stands for a virtue. Power. Pride. Confidence. Courage. We felt like they were all things we stand for so we drew inspiration from them. I love that you’re combining social consciousness and eco friendly aspects into your products. How did you come up with the idea to combine these into a luxury line? The socially conscious aspect came first. In fact, it’s the entire reason we decided to start the company… because we saw a need in India with orphaned girls aging out of the home we worked with and needing employment. The eco-friendly aspect came about as a natural response. We wanted our workers to be working with natural dyes so that it was safe for them and the environment…so we searched on all the other components of our product…especially the leathers to ensure the entire product was “clean” so to speak. We chose to do contemporary luxury because we are personally drawn to fine things and felt there was a gap in socially conscious items which are also refined and luxurious. What inspired you to work with WE CARE India? 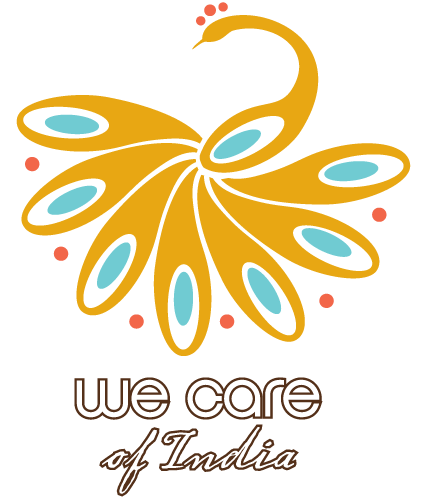 WE CARE of India is a non-profit I started after studying at Paris Fashion Institute. While in school I met a lady on a train who was doing amazing work on behalf of abandoned girls in South India. It has now been 12 years since that chance meeting and we have been working together all this time. We have been dreaming about ways to employ these girls as they age-out of the home and need employment….and Lions in Four is serving as the economic engine to create demand for the silks they create. What has been the biggest obstacle you’ve come across while creating your conscious business and how did you work through it? Our biggest obstacle, I would say, is finding the right people to work with. Everything from our website, manufacturing, PR, branding…you name it…requires us to find the right people to work with. We haven’t nailed it every time and we are learning to really take our time and do our research before partnering with anyone. This is our baby after all…. The greatest success so far, however, has been my two business partners. We work together seamlessly and are all passionate about the company. How would you describe Lions in Four’s style? Where do you get your fashion inspiration? 1. The fabrics…. Our Suede back came about after seeing this Italian brand at a textile show. The suedes were so yummy I wanted to work with them. It took two months to get them to work with us because we a new company. 2. Our woman…what would add beauty AND function to her life….How can we make her life easier and more beautiful. What’s one piece of advice you would give to budding social entrepreneurs? Read…. Read any book you can get your hands on that is written by someone who 1. Has what you want to have…and 2. IS where you want to be. We can learn so much and avoid so many mistakes by learning from others. Sheila (my business partner) and I are constantly reading and when we feel like it’s an amazing book we both read it together. You’ve already created some beautiful clutches and scarves, but do you plan to expand into other products? What are some of your plans for the future? This Spring we are adding two new silhouettes of handbags. We are also bringing in more exotic skins because our python is going over so well. We will be introducing more color of course this spring which is fun. On the scarves we have the SOFTEST hand-woven mulberry silk scarves coming out and we partnered with a young Indian designer to do a print he created. It sounds like there are some awesome things coming out in the spring, but check out what they have available now. I’m obsessed with these scarves. Could they be any cozier? 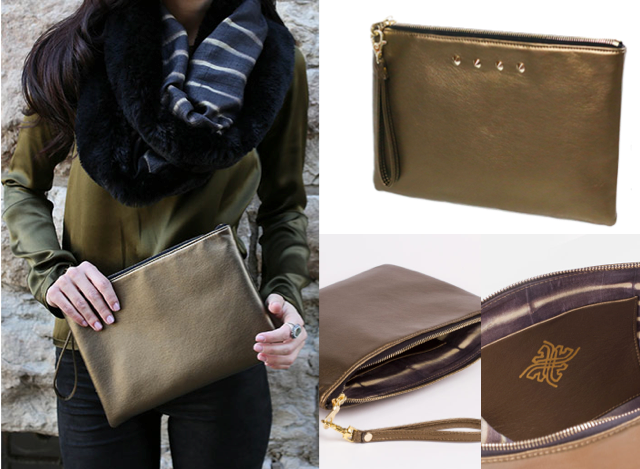 And their clutches are the perfect size to carry all the necessities without weighing you down. 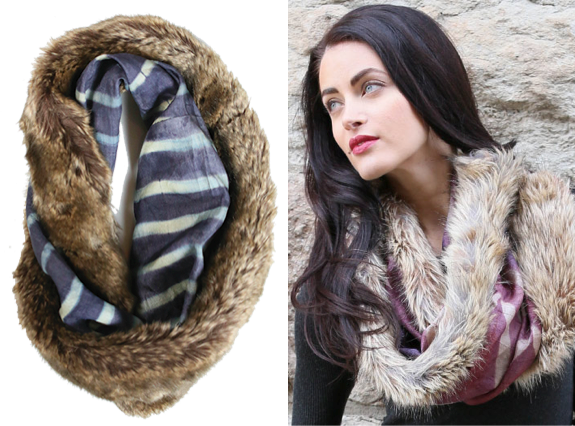 You can check out the other color scarves and clutches at their website. And be sure to keep an eye on Lions in Four because I see great things coming from this company in the future. Categories: Uncategorized | Tags: clutches, eco-chic, eco-friendly, Empowerment, entrepreneurship, fashion, fashionable, Giving Back, India, interview, Lifestyle, non profit, Scarves, trendy | Permalink.